Enjoy Dubai on Great Safaris Dubai – 4 Days extension. Dubai, in the United Arab Emirates, is a city well-known for luxury shopping, ultramodern architecture and a lively nightlife scene. Burj Khalifa, an 830m-tall tower, dominates the skyscraper-filled skyline. At its foot lies Dubai Fountain, with jets and lights choreographed to music. 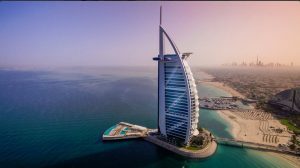 Set on an island, Burj Al Arab is a striking sail-shaped building housing a luxury hotel; its stunning profile and has been featured in films, television programs and advertising. On artificial islands just offshore is Atlantis, The Palm, a resort with water and marine-animal parks. Dubai has been called the “shopping capital of the Middle East”; it has has more than 70 shopping centers alone, including the world’s largest shopping center, Dubai Mall… a true shopper’s paradise! Dubai is also known for the classic dhows which ferry visitors across Dubai Creek to the traditional souk districts located on either side of Dubai Creek, which divides Deira and Bur Dubai, two districts of the city. To explore more of the U.A.E., we suggest that you combine Great Safaris Dubai – 4 Days extension with our Great Safaris Abu Dhabi – 4 Days extension. Great Safaris Dubai – 4 Days extension includes three nights accommodation including ground transfers. Discover the world’s tallest building, shop ’til you drop in some of the world’s largest shopping and entertainment destinations, uncover hidden gems in a traditional souk, or treat the family to fun-filled attractions, water and theme parks, all these choices await you in Dubai!